I hadn't passed many miles on U.S. 169 after leaving Lake Oologah before I arrived at Nowata, Oklahoma. "Nuwita" means "welcome" in the Cherokee language. Follow the link to find out how Nuwita became Nowata. Nowata, population about 4,000 is home to the Ironmen high school football team and is also the home of the fictional Possums football team. It was dinnertime and I saw several of the usual fast-food suspects along the highway and was about to pull into Subway when I noticed this resaurant. 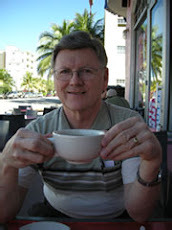 With all those pickup trucks parked at Bliss Restaurant, how could I not give it a try? 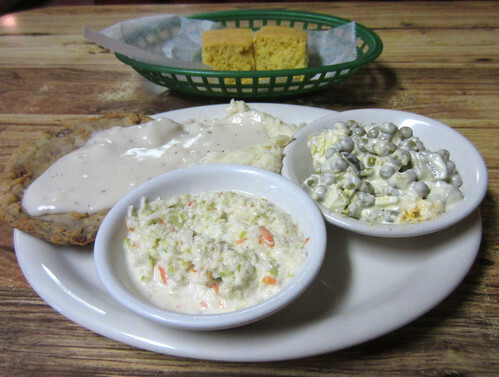 My waitress recommended the Bliss-Burger when I asked for suggestions, but I seldom pass up a chance for chicken-fried steak. 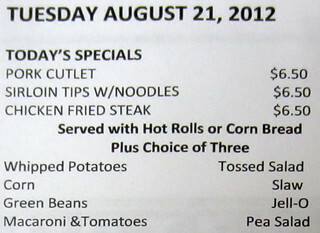 And here I could get it with three sides, plus cornbread and still not need $7 for the check! I can't say it was in the top half of the chicken-fried-steaks that I've ever had. But it wasn't the worst and the gravy was good. Next time I think about ordering pea salad, though, I am going to ask if the peas are canned, fresh or frozen. When I show this picture to Linda, she's going to say, "It needs some color!" 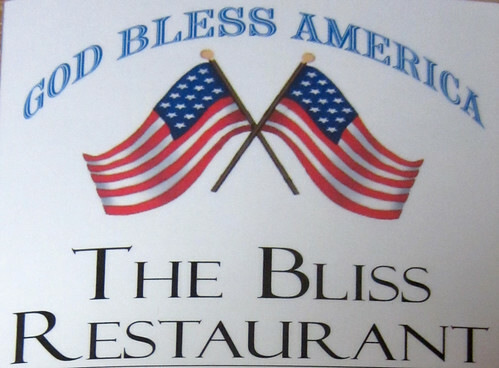 Hello my name is George Forster amd I am one of the Grandsons of the original owner of the Bliss Restaurant. Her name was Lenora Pryse and she started it in the 1960s and I think she sold it in 2002 or 2003 but she worked there for a few more years. Sadly she passed away this morning. I know just about everyone in that town had met here at one point or another. Any kids that came in she had a huge candy case at the register and she always gave kids free candy, she cashed checks, she loaned $$$ and if you couldn't pay she just tell ya well you will make it up the next time. She would open at 0500 and close at 1000 one of the hardest working women one could have known or met. Wished you could have came in while the Bliss was at its prime.